Since moving to Melbourne, Australia, I’ve had a lot of people ask me how I went about the move, whether I found it daunting etc. So I thought I’d write a post explaining a little about what I’ve done and why I’ve done it. My boyfriend Stew has spent the last year already in Australia, working in Perth where he has some family. He was a huge help in planning for our trip together and has been a big factor in why I’ve settled in so quickly in Melbourne. Without his experience and knowledge I would’ve been very lost! For UK citizens it is fairly easy to apply and be granted a 12 month working visa for Australia and New Zealand. However, to stay for a second year you need to complete 3 months worth of regional work. Hence why Stew was in Western Australia where there is a lot of opportunities to complete this work. Once he had done so, been signed off from his employer and been granted his second year visa, I began booking things for myself. I applied for my visa online and it was granted over night in less than 12 hours. I had an email confirmation with my visa number on which I printed off in case I needed it when I landed but it is an electronic visa attached to your passport that begins as soon as you land in Australia. First we looked into flights… Stew came back to the UK just before Christmas for 3 weeks to visit family and friends so we knew what date we wanted to fly back out together. I used many different websites to compare flight times and prices. Last April when I flew to Sydney for a 2 week holiday I flew with Emirates which was a fantastic airline to fly with. They made the 24 hour flight so much more bearable with an extensive selection of brand new films, TV and games. Plus the food was delicious! And it’s rare you can say that about plane food. Being treated to a number of different meals plus snacks including pizza and ice-cream, we also got to eat with metal cutlery and were given hot towels to cleanse with! Although the flight was excruciatingly long, Emirates made it that much better. I would highly recommend flying with them if you can. 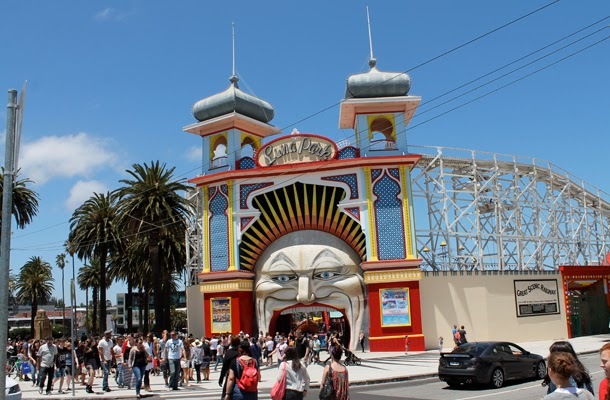 After booking the flights I booked a hostel in St Kilda for 3 nights to start us off. 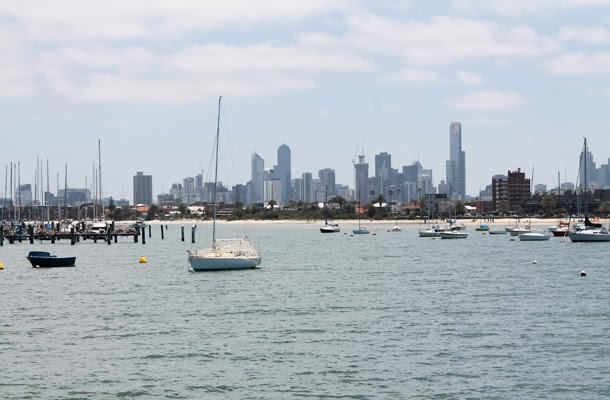 St Kilda is a lovely area of Melbourne full of coffee shops, restaurants, a really nice beach and plenty of night life. It’s also really close to Chapel Street where you can find even more places to eat, drink, dance and shop! We always knew we wanted to stay in this area from having been there for 3 nights last April and from friends advice. I then made long lists of what I needed to buy before going, what I would need to pack, and what confirmation emails I needed to print off (I’m a little OCD with planning/organising). When entering Australia because I have a brand new passport I was able to enter via the e-passport area which meant I didn’t need to speak to anyone. My passport was scanned, a photo was taken of my face and the gate opened! It was so easy 🙂 When I applied for my visa it did mention that you’d need $5000 which is around £2700 which I had saved but didn’t have on me (it was waiting in my UK account to be transferred as soon as I opened an Aus bank account). But this was never brought up when I entered the country so I don’t think they check this, especially if you can go through the e-passport section with no problems. Since landing and having Stew to help guide me through setting up in Australia I have managed to get an Australian sim card for my phone, open a bank account and we’ve found somewhere more permanent to live 🙂 We move into our 2 bed apartment at the end of the month! I’m so excited. 1 tip for moving your phone to another country, get it unlocked before you go!! O2 took around 4 days and 3 phonecalls to unlock it. It was a nightmare, I don’t know why it’s so hard but I’m so glad I had Stew to tell me to do it before I left as it’s even harder when you’re in another country. Because my phone was unlocked I was able to put an Australian sim card into it immediately and I now have 3G back in my life 😀 haha.